Something very important seems to be getting lost in the Ground Zero community center and mosque debate. On September 11, 2001, 3000 innocent people died in the horrific attacks in New York, Washington and Pennsylvania perpetrated by the terrorist group al Qaeda. To be sure, the families of those killed have experienced tremendous pain and suffering. No one denies their loss. And a majority of them have voiced vehement opposition to the planned mosque, saying that it is an affront and a dishonor to the victims and their families. But we need to be very clear about one thing: all Americans are victims of 9/11. We may have experienced this unfathomable tragedy on very different levels, but we all suffered that day, and all of our lives have changed since. No American owns this tragedy more than any other American, and no one gets to speak for the rest of us. We are all entitled to our opinions on this very controversial mosque matter, and that's what seems to be getting lost in all the political posturing. While I did not lose a family member on that fateful day, I did lose a friend. And I live five blocks from Ground Zero, as I have for the last eighteen years. I breathed that polluted and potentially toxic air for months, and I have a very vested interest not only in affairs of national scope, but of those in my personal backyard as well. Does my voice not count? Does my opinion not count? Am I, and countless others like me, expected to yield to the forces of anger, revenge and bigotry simply because I did not lose a family member to terrorists? The truth is, while I did not lose a loved one on 9/11 I have experienced unfathomable pain and suffering when my wife was brutally murdered in 2006 by a 19-year-old illegal alien, leaving me to raise our 2 year old daughter alone. Was I shocked? Horrified? Angry? Vengeful? Full of hate? Sure. During these past four years I've probably experienced every emotion one could. But this horrible experience did not fundamentally change who I was or what I believed in. It did not change my core values. It did not change my love of country or my respect for our rule of law. It did not give me the right to circumvent the U.S. Constitution or re-interpret the laws which protect and serve our citizenry simply because I was suffering. It also did not make me the de facto authority on illegal immigration, nor turn me into a xenophobe. I am truly saddened by what's happening in America today. Saddened that so many are forgetting what our nation stands for and the principles on which it was built. America is a refuge for millions who suffer discrimination all over the world. This is where people come to be free, to escape religious persecution, not to find it. The conflating of the 9/11 terrorists with the overall Muslim faith, and the fear-mongering that goes along with all the incendiary political rhetoric being tossed around, conjures up memories of Japanese internment camps, McCarthyism, the KKK and other ugly chapters in U.S. history. 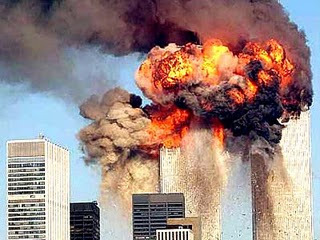 Terrorists attacked us on 9/11, not the Muslim faith. As such, suggesting that this mosque shouldn't exist two blocks from Ground Zero is tantamount to suggesting that, because of the priesthood's pedophilia scandals, that a Catholic church shouldn't be two blocks from a school. Both assertions are equally irrational. Have we as a nation learned nothing since the 1940's? Fear is ugly, and it makes people do and say awful things to each other. And the proposed community center and mosque near Ground Zero has, and rightly so, stirred the passions and emotions of many. But we cannot allow one group of 9/11 victims to demand that other 9/11 victims abrogate their core principles or change their perception of America's core values. We are all 9/11 victims, and we all have a say on this subject. And that includes the many Muslims who died that day as well, and their families. More so than anything else in this debate, American pluralism, and the U.S. Constitution which guarantees it, is what needs to be defended and honored. Thanks. I agree. Another superb post. You've gained a reader. Alternate Brain's Gordon sent me. If a man of his intellect falls into the trap -hopefully momentarily- of equating the religion of a killer with the killer, why do we expect something different from the average citizen? The fact that 65 percent of Americans do not want the mosque built there is proof that we're all Americans who are concerned, not just those who lost loved ones in the attack. As someone pointed out on a TV talk show, we would not want a liquor store, albeit legitimatly built, next to the Betty Ford rehab center to remind patients nor a strip joint next to a middle school. In fact, the whole area should be a memorial park as was suggested soon after the tragedy. For once, it would be nice if the majority had a say in the affairs of our country. I fail to see the analogy. You mean that if someone sees the proposed Islamic Center he might relapse into what exactly? The majority has got it dead wrong. They are confusing Islam with radical islamism. And when I hear that we should not build the Islamic Center because we are at war with radical Islam, then someone please tell them that the proposed center will not serve radical Islam. Girls will be playing basketball in shorts over there for crying out loud.... Any idea what radical Islam would do to these girls in some Third World countries? Therefore, if you want to fight the radicals and fundamentalists, and I am with you on that one, help moderate Islam establish itself.For moderate Islam is at war with radical Islamism too. The moderates are on our side. What the majority "wants" or in this case "understands" can never be the the guide to action. The constitution and the legal system should be. That can not be negotiated. If there were a legitimate non-religious reason to deny the creation of this Muslim cultural center I would be all over it. But as it is clear that this is only fundamentalist Christian religious bigotry at work. Even Sarah Palin grudgingly allows they should have the right to build this center. Who then is behind the opposition - and why? Enquiring minds want to know, yet where is the National Enquirer? Or any other major media outlet? Methinks something rotten in the Borough of Manhattan and it isn't just the street trash! Someone needs to expose this before it becomes unstoppable and leads to something we really don't want!